I hope you will excuse me writing to you direct, but I understand that you are the Chairwoman of the Rules Committee responsible for the approval (or presumably disapproval) of amendments to be presented to the House of Representatives. I am writing because I have been informed that congressman Steve Sheppard has drafted an amendment to the coastguard Reauthorization Bill which would allow the Delta Queen to continue her operations under her existing exemption from SOLAS. Iunderstand that there is a danger that she may lose this exemption later this year which would deprive your wonderful country of this floating icon. I am Chairman of an organization which represents the owners and operators of traditional and historic vessels in UK waters and we take a strong interest in US maritime heritage which has so often given a lead in the past. We do of course have a very special interest in the Delta Queen since she was built on the Clyde in Scotland. I hope you will not consider it improper therefore if I write to express my support for this splendid paddle steamer in the hope that the legislation can be amended in such a way that she is allowed to continue plying her trade as she has done safely for the last 82 years. I am particularly aware, as a retired Colonel in the British Army, of her contribution to your war effort when she served as a troop barracks and carried servicemen to San Francisco Bay. I feel so strongly about this matter that if it were to help her cause, I would be more than happy to visit you and your colleagues in Washington and/or give evidence to any committee which is considering the proposal. I thnk you for your attention to this matter. Greene Family genealogy - now online! http://www.greenereunion2008.com/ [now offline].The Greene family brought the Delta Queen to the Mississippi River after World War II. The Delta Queen Needs Your Help NOW!! Still no date for the Coast Guard bill. The hopeful news is that even if the Rules Committee does not approve our amendment, the House Leadership can over-ride Oberstar and send H.R. 3852 directly the floor as a stand-alone bill on the suspension calendar. We all need to contact these three people NOW, while we're waiting forthe CG bill to move forward, and ask them to Save the Delta Queen. We need to stress the fact that this has always been a non-partisan issue and that it needs to remain one. In this case, two out of the three will accept email from people who are not in their districts. A fax is still the best way to reach them, but because email is easier, more of our supporters are likely to use that method. Re. : George Clooney visit to promote his new movie, "Leatherheads." Let's have a show of support for the Queen! Get the word out! You can make a difference!Please make a large, colorful placard with a drawing of the Delta Queen, or a slogan, suchas "We love the Delta Queen." Please keep it positive. 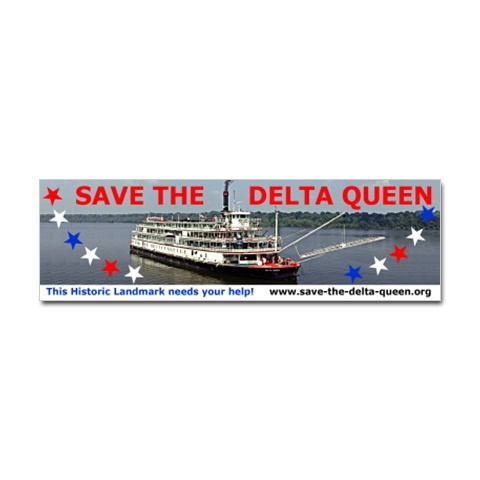 "America loves theDelta Queen," "We love U.S. history - Save the Delta Queen," or my father's bumpersticker in 1976: "I'd rather be a steamboat than president. "Bring your camera. I will post your jpgs here at Steamboats.com. Vicki Webster, Delta Queen Campaign, adds: "Major movie screening at 7 p.m, with one or moreearlier showings. But all day long there will be a lot of Hollywood-style hoopla, with nationalmedia present to record it all. So whenever you can show up -- DQ signs in tow -- your show ofsupport will help The Cause enormously." 1. 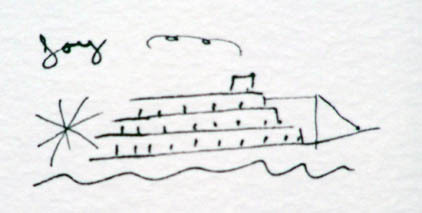 First draw a horizontalline at the waterline, just a straight line, to represent the first deck. 2. Draw a few more shorter horizontal lines above that, for the upper decks. 3. Add thewheel at the bow, with simple spokes, almost half way below the water line,and reaching to the second or third deck. 5. Add the pilot house, smoke stack, mast, and rigging. There you have a simple steamboat. You can also add horizontal lines for the observation windows;or little squares for the stateroom windows. Here is an example, below. 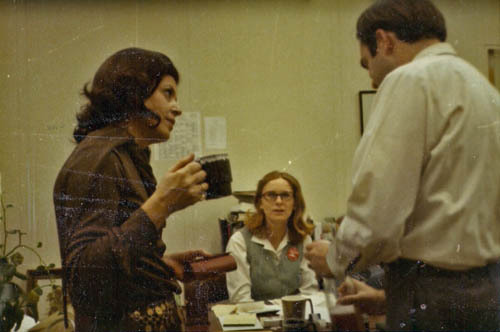 Vicki Webster took this photo of Betty Blake and two of Congressman Bill McCullough's aidesin McCullough's office in December 1970, just after the victorious vote. Vicki said, "We hadjust cracked the champagne -- that's what is in Betty's coffee cup." * In sensitive areas the wooden superstructure, including overhead beams and the boat's roof, have been replaced with fire-retardant or fire-resistant materials. * The Delta Queen is outfitted with the latest fire detection and suppression systems, mandated by the Coast Guard after 2000, and installed in accordance with their specifications. Fire, smoke, and heat detectors and sprinklers are located in every room on the boat. The system is monitored round the clock from the pilot house. * Dedicated watchmen use a key-station system and patrol the Delta Queen all hours of the day. * The general alarm and public address system, manufactured by Hose-McCann, is the same one that is being installed on the US Navy's newest ships. It far exceeds the requirements for the Delta Queen, but its installation was part of the company's plan to bring her into the next century. * The Delta Queen has an inherently safe design with almost every room opening directly onto an outside deck. The few interior rooms have exterior windows, are no farther than 20 to 30 feet from an exit, and each one opens into a broad salon, not a hallway. All exit stairways are outside. The Delta Queen is in superb condition and rarin' to keep steaming the rivers for many years to come. Click here for more Delta Queen news. Research Archive (click here)This archive lists all the pages in this folder, which includes all the old guestbooksand latest news pages. It's composed of this n that, but the archive puts it all ina logical order. Mystery boat answer (click here)Another boat identified by one of our visitors. New model boat photos (click here)by Virgil Reynolds. New from Dave Thomson (click here)Keep clicking because he sent in lots of photos. These are larger, as well.I still have a lot more to add to his wing of the online museum. New ancesetry stories (click here)these sent in by Pete Swanson, going back to the Civil War in Illinois. Video of the Delta Queen engineroom (click here)Scroll down to see footage of the pitman arms turning the wheel. Dwight Hartman Models (click here) A displayof the models of the late Dwight Hartman. More news soon on how his model kits will besold now that he has gone. Stay tuned. Who built the first steamboat? (click here)New research shows the first steamboat was built in 1543 in Spain, by Capt. Blascode Garay. Virtual steamboats raced on the Internet in 2007 (click here)Find out how you race steamboats online and who won last year.